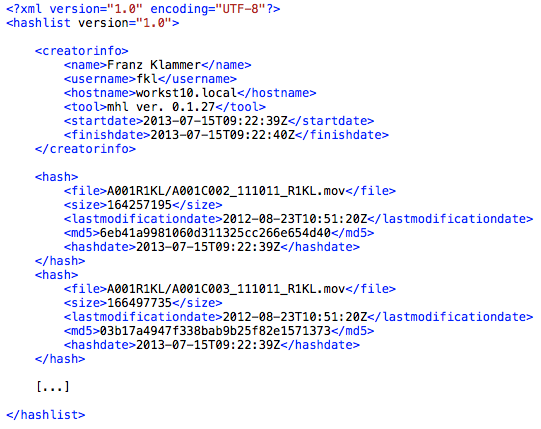 MHL files are a written in an straight forward XML format. In addition, they contain information about each file together with creator info. Below is an example of a basic MHL file. The MHL tool requires the MHL file to be placed along the path of the referenced file. This allows for an easy discovery when looking for an MHL file for a specific file. By default, the MHL file is located in the current directory you were in when calling the MHL tool (see section ‘MHL file naming’ above). You can manually specify the location of the MHL file, by passing the ‘–output-path’ option to the MHL tool.